From the scrapbook of the late Mrs Dorothy Beedham. Arthur Ward is remembered on the Methodist Roll of Honour in Bottesford as having served in the Royal Army Service Corps (RASC), and is also named on the Bottesford ‘church list’ of WW1 Servicemen. 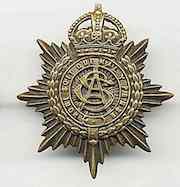 He was one of the five sons of Emma Jallands to serve in the army during the First World War. Emma (nee Asher) and her first husband Arthur Ward senior had three children including Arthur junior, the subject of this biography, who was born after the early death of his father. 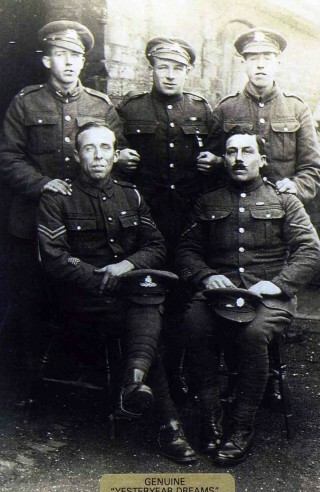 Emma married again, to Joseph Jallands, and they had a large family which included four sons who enlisted, making a total of five, all of whom survived the war and lived into old age. Arthur William Ward was born on the 26th February, 1884, and baptised on the 1st June that year, in Bottesford parish church. His parents were Emma Asher from Bottesford and Arthur Ward, a railway platelayer from East Bilsey, Norfolk. He had two older sisters called Harriet Asher and Mary Ellen Asher, born before Emma’s marriage to Arthur Ward, and an older sister Martha Ward. Sadly, his father died on the 21st September, 1883, a mere three years after his parents were married, and Arthur was born five months after his father’s death. Emma went on to marry Joseph Jallands in 1886, and Arthur Ward was brought up by Joseph and Emma, along with his sister Martha and step sisters Harriet and Mary. Harriet died in infancy, aged 9. They went on to have eight more children: Walter, Sarah, Annie, Ernest Henry, Herbert William, Edith Emily, Albert Edward and Hilda. At the 1911 census, as well as supporting their children and some of their stepchildren, they were also looking after their grandson Cecil Henry (age 2) and granddaughter Ida Ellen, aged 1 month. The family lived In Bottesford at 6 Mill Lane at the 1891 census. In 1901, they were at 6 Muston Road, then by the 1911 census they had moved next door to 5 Muston Road. Before 1911, they sometimes recorded their name as ‘Jalland’, rather than ‘Jallands’. Joseph, an agricultural labourer, described himself as a horseman on a farm in 1901, and as a waggoner in 1911. The family would have grown up with working horses. By the time of the 1901 census, Arthur, now 17, was working for George Tinley, a farmer at Normanton, as a waggoner. He married Mary Rawden from Ropsley on the 26th October, 1909. She was 25 years old, the daughter of Richard Rawden. By the 1911 census, they were living on the High Street, Bottesford. Arthur was working as a platelayer on the railway, and they had a daughter Phyllis May aged 10 months. They had a second daughter, Edith, but on the 14th November, 1914, the Grantham Journal reported the sad news that Arthur and Mary’s daughter, Edith Emma, had died on November, 5th, aged 1 year and 7 months. He was active as a bell ringer in the village and was elected to become a member of the Society of Farmland Ringers in 1912. GJ 11th May 1912, on May 7th, the 37th annual meeting had been held at St Denys, Eaton, in the Vale of Belvoir, arranged by Rev Francis Nugee, Rector of Muston. The Bottesford men attending were Wm Turner, S Baker, T Rawdin, D Gilden, M Bend, R Bend, H Thorlby, C Lamb, W Kirton and A (Arthur) Ward. “Four Soldier Sons” – Mrs J. Jallands of Easthorpe has now four men serving in His Majesty’s forces – a record we believe for Bottesford. We congratulate Mrs Jallands on the patriotic example of the members of her family. “More Recruits” – Messrs H. Harby, A.W. Ward and F. Wilcoxson – all three G.N.Railway servants – were called up for service on Monday. We understand that Mr J Geeson, who had been village postman for some time, has also been accepted for service in the army this week. 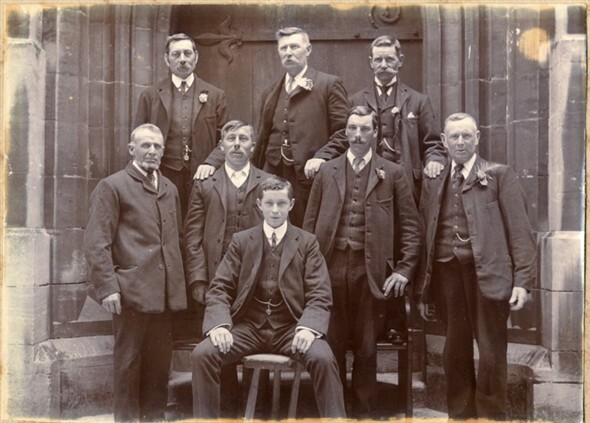 The third article, “Church Bellringers”, started – On Saturday, the ringers gave 352 changes of Bob Major and a quarter-peal (1260 changes) of the Grandsire Triples, as a “send-off” to one of their members, Mr Arthur W. Ward, who has joined Lord Kitchener’s army. 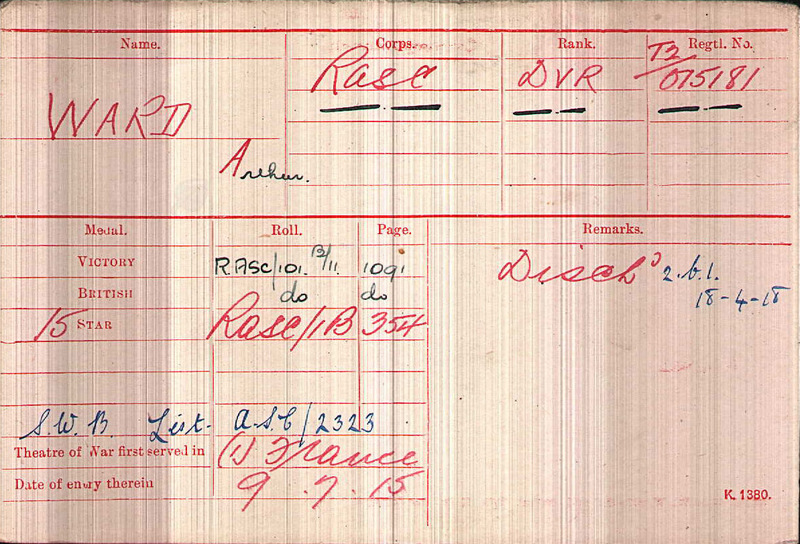 There are few surviving service records for Arthur Ward, and we are very grateful to Anne Wilson for providing family recollections. In WW1 Arthur Ward served in the RASC, following his call up which was reported in the Grantham Journal on the 13th March, 1915, together with that of H. Harby and F. Wilcoxson, all three G.N. Railway workers being called up at the same time. He would have been 31 years old. He was a mule driver and served in Egypt, the Dardanelles and Salonika, but was eventually invalided out, suffering from severe dysentery. 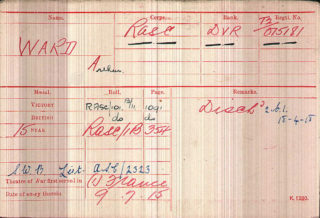 His Service Number was T2/075181. There are more than one MIC for RASC men called Arthur Ward, and it has not been possible to determine which belonged to the man from Bottesford, regrettably. Please follow this link for more information about the lives and service records of the Jallands men. 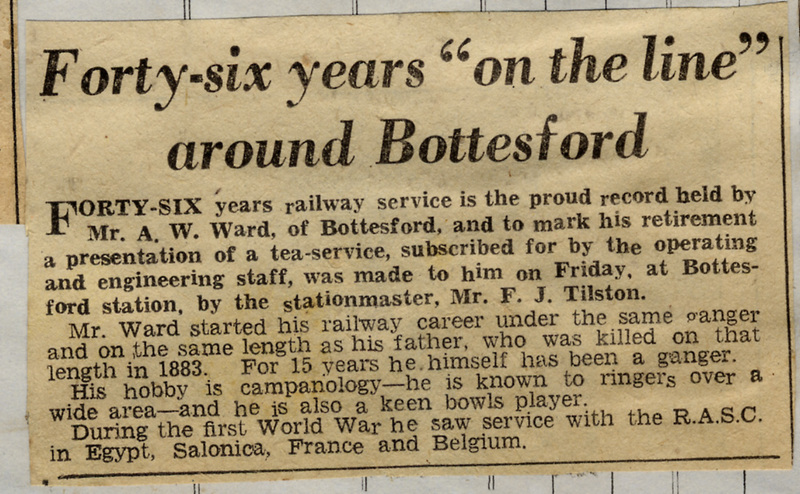 Arthur Ward worked as a ganger on the railway, and retired after 46 years of railway service in October, 1951. Before and after retirement he took part in many aspects of village life. He was caretaker at the Victory Commemoration Hall (forerunner of the present day Village Hall) and at the National Provincial Bank on the High Street. From 1907 to1969 he was a bell ringer at the church. From 1920 he was secretary of the Village Pig Club that was wound up in 1960. He was a founder member of the Bottesford Village Produce Association and became its Honorary Secretary. In 1949, the members put the decline in membership down to a lack of interest in the gardening community, and it was decided to wind up the association as soon as possible. He played bowls until 1972 and was secretary of the Bowls Club from 1936 to1955. He was a founding member of the Bottesford branch of the British Legion, and also a member of Forget-me-not Club from its inception. He and his wife celebrated their Golden Wedding in October 1959 and their Diamond Wedding in October 1969. Mr and Mrs Arthur Ward lived on Butcher Row. Mrs. Ward organised fund raising for the hospital, such as fetes with fancy dress competitions. Families paid 6d a week to the Sick and Dividing Club. When they needed it, people who had contributed had assistance with payments to doctors and hospitals. When the cottages were closed for demolition in 1962, Arthur Ward was one of the last tenants to live in them. When Arthur Ward was buried on the 21st September, 1973, the church bell at St Mary’s pealed out his 89 years of age. 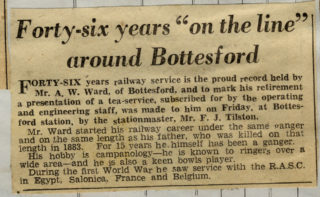 This is my great grandad – so nice to read.